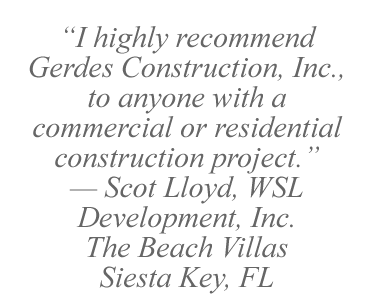 Gerdes Construction is one of southwest Florida’s leading builders of superior quality multi-family homes and residences. Our projects typically range from two to twelve units and feature custom designs meticulously crafted to showcase the personal tastes of individual owners while maintaining an overall sense of integration, security and common purpose. As a full-service, LEED AP certified design and build company, Gerdes Construction also specializes not only in providing exceptional quality craftsmanship and work during the construction phase of your project but is there to assist you with everything from preconstruction planning and consultation to post-construction assistance as well. Assistance with selecting an architect, if needed, or we will work with your architect of choice. Recommendations for construction materials, fixtures, appliances and other quality design elements for your project. Selection and scheduling of only the best-qualified sub-contractors and vendors. Regular communications and meetings to keep owners abreast of progress. Collection and coordination of all as-built drawings, operation and maintenance manuals, and warranties as required. Assistance with obtaining all documentation and occupancy permits to complete your project. A commitment backed by 20 years of satisfied customers to keep your project on time and on budget. Click to View Samples of multi-family and residential projects completed by Gerdes Construction.